Let It Snow ..., originally uploaded by SkeletalMess. Being one who loves winter and all she brings, I find I enjoy composing winter scenes. Although I'm in no hurry for snow just yet, can't pass up the explosion of falls colors. Winter is the best. This is very beautiful, Jerry. This is just lovely! Which is funny, because I watched 'Lovely Bones' last night and this reminds me of the film. It is sad and beautiful at the same time. Oh, that is simply beautiful. I love the blues & greens. As if the sun has just set! When I view your images, I'm always curious what textures (if any) you used? Wow! That is stunning and very atmospheric - Love it. I haven't been out and about much. I don't like winter. I could even live without winter! But I do like your winter-picture a lot! It's so pretty! And I like that the birds are flying so low. So beautiful and dreamy! Do you start with a concept of what you want to do and find a photo or photos, or do you choose the photo first and let it inspire your finished creation? I normally go through old photos and usually there's one or two that catches my eye, which starts a chain of events "creatively" and I build upon that. Proof that one thing leads to another! Being Finnish and living here in Thunder Bay is a double whammy for loving winter!! We are having unusually mild weather now with no snow in sight for a while anyways. Strange! What an absolutely beautiful image so moody but also ethereal!!! Hey Jerry, I'm in the process of writing a novel and this would make an AWESOME book cover. Write me back and let me know what you would think of the idea. It's fantastic. 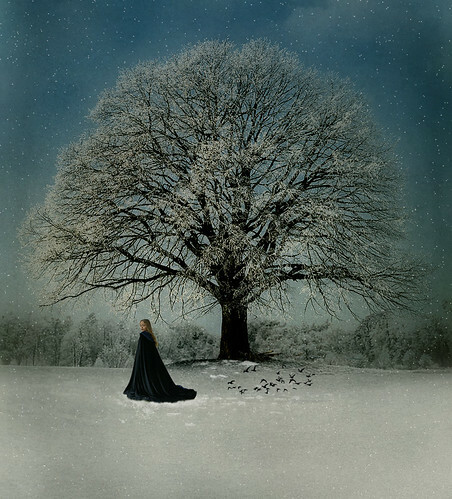 I love the round-ness of the tree and the under circle of the birds leading to the girl in the cape. You have a great website which is so helpful. You appreciate art in a special way in that you want others to create their own.